Selectabase provides a useful service to small and medium sized businesses who are looking to grow and expand. By offering companies relevant, targeted and proven lists of data for prospective customers, Selectabase is able to help you increase your client reach and broaden your range of leads. 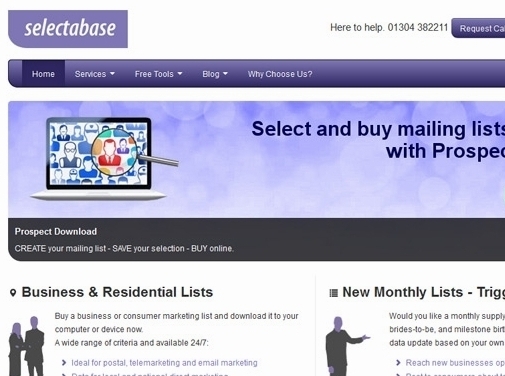 Dealing primarily with database lists for both B2C and B2B operations, Selectabase can provide you with brand new targeted data that is perfect for postal, telemarketing and email marketing campaigns. With more than 2.8 million businesses and 38 million residential contacts in the database, you can get whatever you need, whenever you need it. Selectabase also deals with data enhancement and cleansing to ensure that your data us up-to-date and as useful as possible. This includes everything from checks to make sure that your email addresses are current and relevant, and also Telephone Preference Service (TPS) checks to screen contact numbers. UK (Dover, Kent) based business providing marketing lists. Website includes details of services provided, testimonials, client list, associations, regularly updated blog, terms and conditions, full contact details. Company website has been online since 2001 according to web.archive.org.